Cologne is known to be one of the most liberal cities in Germany which is likely why the Cologne Carnival, or Kölner Karneval in German, is one of the biggest Carnival celebrations in the world. Since there has been continuously been more than one million spectators on the streets for Carnival’s Rose Monday parade each year in Cologne, the Cologne Carnival is considered to be one of the largest street festivals in Europe making it a fun tourist destination. Before I start talking about how crazy my visit to the Cologne Carnival celebration was, I’ll explain a little about the history of Carnival as the history of Carnival is really what makes it what it is today. The history of the Cologne Carnival is almost as old as Cologne itself, although the organized Carnival in Cologne only dates back a couple centuries. The actual history of Carnival in Cologne is long, complicated, and often disputed, but I’ve done my best to summarize the most reliable historical information I could find below. The origins of Carnival go back to when the Greeks and Romans celebrated Spring festivals in honour of Dionysos (god of wine) and Saturn with wine, dancing, and music. Since Cologne was a Roman colony, it too celebrated the feast of Saturnalia. The feast and celebrations included a lot of drinking and joking and authorities granted great leniency to the people, meaning they had freedom to joke and criticize authorities without fear of repercussions. Over time, Christian influences gradually mixed into the celebrations and ancient Germans began celebrating as part of the official church calendar, six weeks before the period of Lent begins. According to the church, the 40 days leading up to Easter are meant to be a quiet, reflective time where people abstain from heavy eating and drinking to remember the suffering and death of Jesus Christ. Thankfully, the church tolerated one last blow-out before the ‘quiet time’ of Lent began and thus people continued to get away with the wild behaviour that Carnival brought. People had so much freedom during Carnival that I have read descriptions saying the “world turned upside down” during Carnival. Drunkenness and partying were acceptable, nobility were openly satirized, and craftsman and workers could parade through the streets like princes. Perhaps this freedom was due to the fact people could hide behind their true identities by wearing masks and costumes. Although Carnival was allowed by the church, it wasn’t institutionalized until the early 19th century, when the Prussians ruled the Rhine. Following the custom of satirizing rulers, people would dress up in the uniforms of Prussian soldiers to protest their rule. The tradition of satirizing military and political rulers continues these days and many of the Carnival clubs have military banners, marching bands, and powdered wigs. There are also stages set-up throughout the city where people perform acts making fun of politicians and other controversial social topics. The Cologne Carnival takes place on the Thursday before Lent each year. The Cologne Carnival Dates in 2016 have Women’s Carnival Day on February 4th, Rose Monday on February 8th and Ash Wednesday on February 10th. 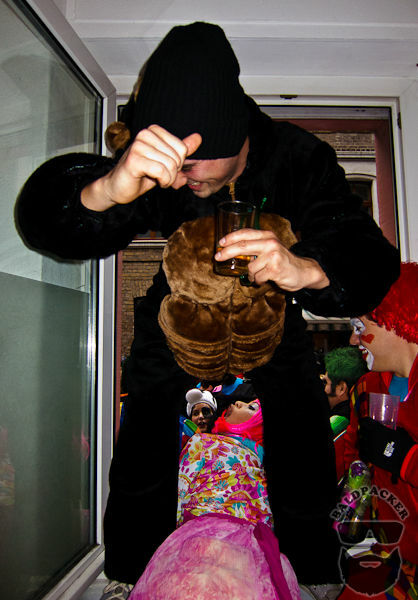 Traditionally, the “fifth season” (carnival season) is declared to begin at 11 minutes past 11 on the 11th of November. 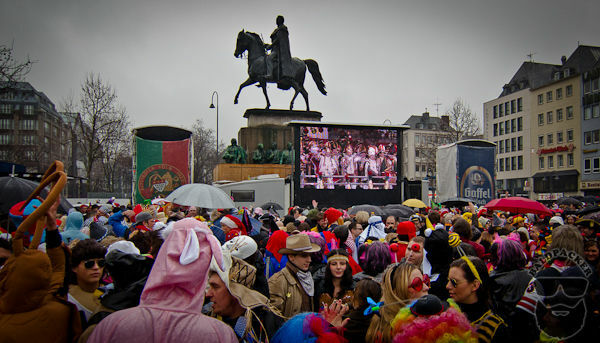 Although the “crazy days” are in February, the 11th of November is also an excuse to party and up to 70,000 people will attend Heumarkt Square for festivities from 09:00 until the early evening. The Carnival spirit is then temporarily suspended during the Advent and Christmas period, and picks up again in the New Year. The Cologne Carnival party is officially declared open at Cologne’s downtown square of Alter Markt on the Thursday before the beginning of Lent. Although Thursday is not an official holiday in Cologne, most people can leave work before known to celebrate the start of celebrations at 11:11 AM. 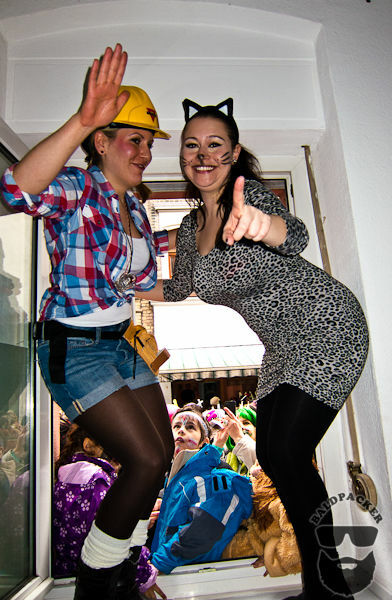 This Thursday is usually called Fat Thursday but is also known as Women’s Carnival Day in the Rhineland. This name is said to be from when women formed their own carnival committee and forced their independence from man. In many towns around North Rhine Westphalia, women still carry out a symbolic takeover of town halls and cut off men’s ties as a continued show of strength and independence. If you’re going to wear a tie on Women’s Day, make sure it’s a cheap one! The “crazy days”, a week-long street festival, takes place between Fat Thursday and Ash Wednesday, with events of historical significance happening each day. The highlight of the Colgone Carnival for most people is Rose Monday, when there is a large parade put on at 10:30 am. 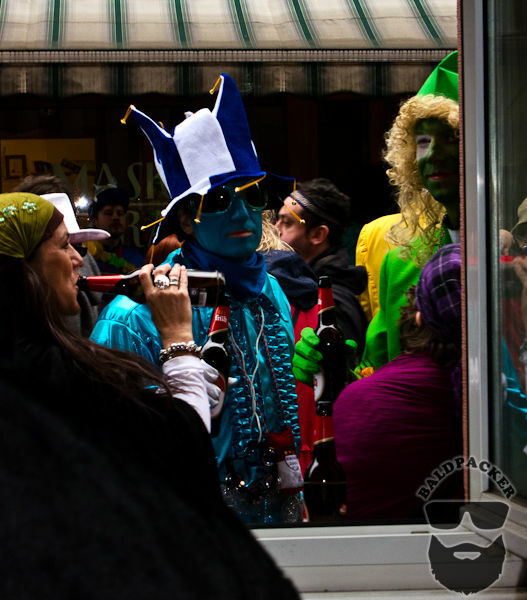 This is the day that Cologne receives over a million visitors in fancy dress and costumes and people let loose. By Ash Wednesday, most people are partied out but meet in pubs for a traditional fish dinner to help soothe their Carnival hangovers. My Carnival Thursday began with a 27€ train ticket from Aachen to Cologne, which was good for regional travel for the day. We caught the train before 9 AM and I couldn’t believe that the party had already started. 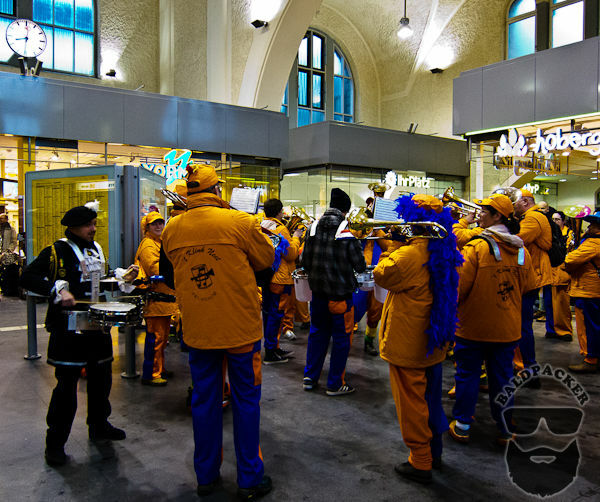 In the train station, a marching band was blasting out traditional tunes and loads of people were in costume with beer in hand. I personally think that’s a pretty great way to start a Thursday and always love to see Germans let loose! 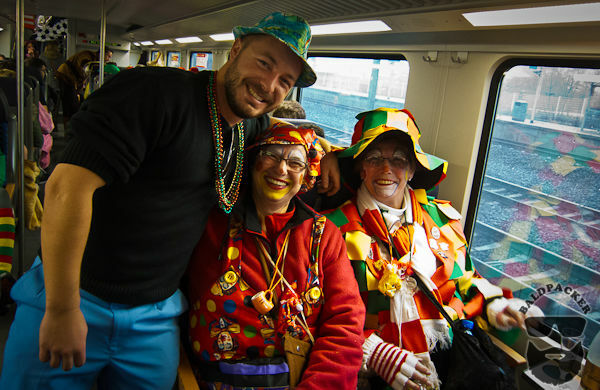 Once on the train, we cracked our first beer of the morning, and I was amused watching 5 women in their 50s or 60s, dressed in clown costumes, also with drinks in hand. They noticed me watching them and called me over to open a bottle of sparkling wine for them. Of course, my German skills are lacking so I called over my friend Clarissa to help translate. I opened the bottle of bubbly, and they offered us both a glass to celebrate this fine day. Throughout the train ride, they offered us more sparkling wine, as well as poppers, which are basically little airline liquor bottles meant to be downed like shots. I love Germans. 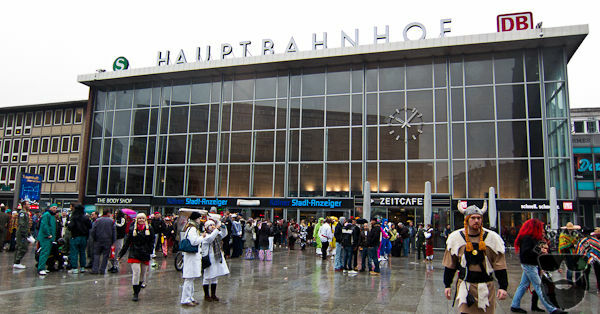 In Cologne, the train station was packed with people in costume, and everyone was already having a good time. The Cologne Cathedral is right in front of the station, and the same marching band from the Aachen train station broke out in song on the front steps. The weather was not great, with cloud and rain on the horizon, but it was still fun to see so many people out in costume, beers in hand, in front of such a magnificent cathedral. After meeting up with more of Clarissa’s friends, we walked through the main areas of Cologne while drinking beers purchased at various corner stores. I love that there are no open liquor laws in Germany like we have in Canada so people can drink and socialize in the streets. Cologne Carnival Crazy Days = Street Party! The typical greeting during the festival is “Kölle Alaaf!”, a Kölsch phrase which can be translated as “Cologne above all!” This greeting should only be used in Cologne and Aachen though, as other cities such as Dusseldorf may use “Helau” and using the wrong greeting in the wrong city may cause the locals to actually want to fight you. This rivalry, which can be quite violent at times, is mostly due to football (soccer), so make sure you support the local team! At 11:11, the party really got going and we bounced from the public courtyard parties with live entertainment to house parties put on by Clarissa’s friends and various bars. Fueled by Kebabs and Kölsch we drank and danced our way through the day having a great time. 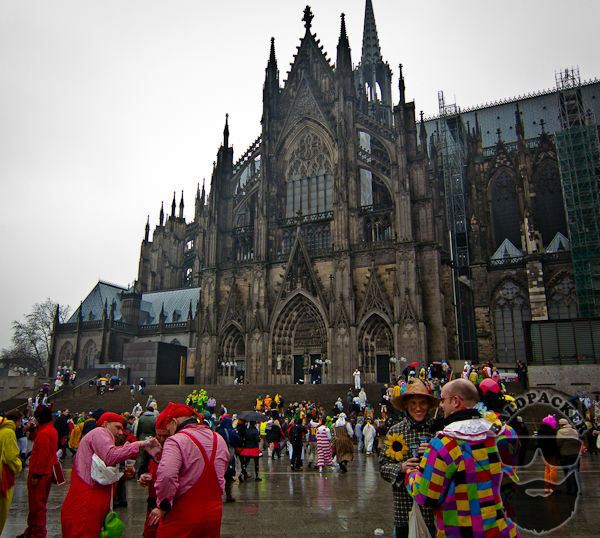 Before traveling to Aachen, I had not heard of the Cologne Carnival, which is a shame given how much fun it was. I’d rank Carnival up there with Oktoberfest for pure beer drinking madness, but less accessible to foreigners due to the historical significance of so many of the activities and events. I think my Cologne Carnival experience was exceptional because I had locals showing me around, taking me to house parties, and explaining to me how Carnival is properly done. 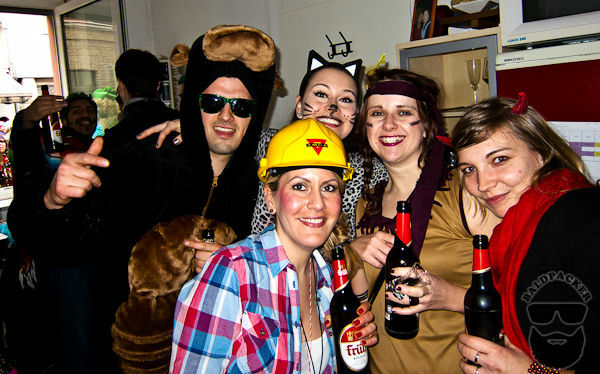 If I were to attend the Cologne Carnival again, I would definitely try to arrange a group to go with, or stay at a hostel and try to meet other people looking to party. Cologne is a very nice city in itself and worth visiting outside of the Carnival celebrations as well. If you’d like to learn more about the city of Cologne, the Cologne Cathedral, Kolsch Beer, and other suggestions for things to see and do in Cologne, check out my Cologne City Guide. Those are some sweet blue jeans Davey!